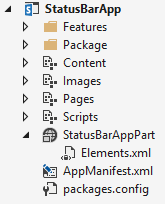 Client App Parts are essentially iframes that can be placed on SharePoint pages. Because Apps for SharePoint run in a different domain name than the host web, Client App Parts are by default restricted from accessing anything on the host page. This makes them pretty “dumb” islands on the page, as they can’t be aware of anything on the host page, and can’t interact with host page elements through the DOM. This post will show how you can use the postMessage api to enable your Apps for SharePoint to write Status Bar and toaster Notification alerts to the hosting page. Basically it’s two buttons that I can use to add status and notification alerts to the hosting page. // Setup click events on buttons. The client app part rendering in the host page. Right now, the buttons will send postMessages, but nothing will happen. You’ll notice that I am sending the message over as a stringified version of a JSON object. This can then be rehydrated on the hosting page as a valid JSON object. In the next section, I’ll add the receiving code and wire everything up. To make this even better, you can implement the operations to remove status, update/append status, and clear notifications, using postMessage actions from the host page to the App Part iframe, sending back the status or notification ids (the reverse direction of what was configured above). Notice the first line and last line. The first line declares an array (spAppIFrameSenderInfo) with a specific size. This array size will vary depending on how many Client App Parts are on the hosting page. For each Client App Part, there will be a corresponding item in this array. Now notice the last line. A line like this is injected on the page for each Client App Part placed on the page, adding specific information about that App Part into the array declared earlier. In the array item representing the App Part, you’ll notice an odd value for the first parameter of the array item. This is a unique alphanumeric number that is dynamically generated fresh on every page request. This value is passed to the Client App Part via the SenderId querystring parameter (if you use the StandardTokens). This SenderId has a couple of parts to it – the first 8 characters are an alphanumeric string randomly generated. Any characters after that represent the index inside of the spAppIFrameSenderInfo array. 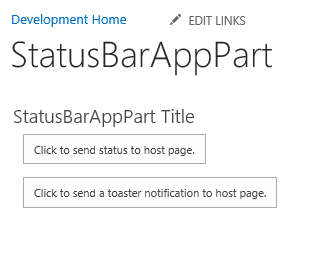 Hopefully I’ve shown how you can use postMessage api to enable Client App Parts to interact with the host page and post Status and Notification items. You can further expand this concept to other things, like popping up Modal Dialogs, displaying Wait Dialogs or loading indicators, or other interactive parts of the SharePoint host page. it doesn’t re-size the frame. Writing my last comment a minute ago sparked something in my brain I guess. The problem was that I set width and height to be fixed inside the edit part settings. I changed the height and width back to the “Fit to zone” option and my postMessage Script worked. Thank you for this article, it was well written and very helpful.